Hi! You don’t know me from Adam (LOL!) But I just wanted to take a second to put a bug in the ear of all the bloggers, podcasters, Scopers (that’s the people making broadcasts on the new Periscope app), curriculum developers, authors, etc out there that are producing resources in this booming industry for homeschoolers. 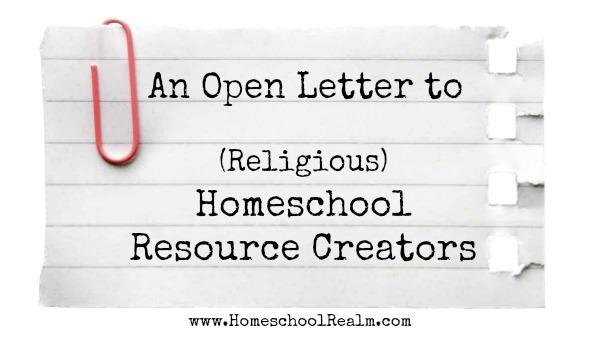 My request is for you to think about us secular homeschoolers. Myself and the many many other non-religious homeschoolers out there would like those of you out there that are open to this (NOT expecting everyone!) to think about us. Specifically, think about including us in your audience by leaving religion out of your content. There’s a zillion religious homeschool content creators already out there…how about you do something different and go nonreligious so you can include more of us? Now…before you get upset with me and feel your beliefs are under attack…I am NOT suggesting you give up or even slacken YOUR beliefs. Nor am I suggesting that ALL homeschool resources should be religion free. NO. That would be unfair and unreasonable. Of course you are entitled to your beliefs and your beliefs absolutely will and should shine through in your content. I am not suggesting otherwise. And of course there is a huge audience for religious content. That won’t change. I mean TRULY inclusive, where you would like to include and share homeschool resources with all. Then please think about providing more non-religious content so that ALL homeschoolers may benefit from it. Leave out the scriptural references, and the constant references to God and prayer. Obviously, if your entire curriculum, blog, podcast, etc is based around this, this won’t work for you….and I’m not asking you to completely change. Realize that your audience is probably just believers like you, but that’s totally fine. I’m talking to those of you that have a lot of what could easily be secular, non-religious content that just would take a little tweaking to make it so. To those of you open to this idea, think about just not using those religious references and instead open up your audience more. And in so doing, you’ll be providing so much to those of us that, in comparison to what’s available for religious homeschoolers, have so little provided to us currently in the homeschool world. I see posts daily. Literally daily. Posted by secular moms begging for references to secular resources. There’s some out there, and some of it is really good…but there’s just not enough. WE NEED MORE. So think about it. And at the very least, give a heads up on religious content in materials reviewed for those that may wish to avoid it. Thats just being thoughtful. We appreciate that. Because secular homeschoolers are on the rise. And while religious homeschooling may still be the majority…at the rate things are going in America, with more and more families becoming dissatisfied with the public education system, I expect that secular homeschooler’s numbers will continue to climb exponentially annually. It already is THE fastest growing population of homeschoolers currently and I don’t see that changing. And yet the vast majority of resources out there are still aimed at religious homeschoolers and we secular homeschoolers continue to find ourselves having to wade through so much to find something we can use and share with our kids. Often things that are not specifically labelled as religious, turn out to be surprisingly so! This is extremely frustrating, and when time is very limited, wasting time is just as bad as wasting money. So if you want to really stand out…make your content secular. Even if you, yourself, are not. Because then you’ll hit a bigger audience. And believe me, the secular homeschool community is big on sharing when new secular content is made available. We WILL share you! And there’s a LOT of us. Not as many as you…but we are many, and growing. Judging just by how often we get comments on our secular homeschool podcast, the Savvy Homeschool Moms, there’s definitely a need and people are desperate for something different. There’s already tons of religious homeschool content creators. How do I plan for a new school year? I would hug this post if I could. Feel free to delete this if you like (I have affiliate links on my site because I spend hours of my time for 30 visitors a day haha), but I have created a site, born out of all of my secular links for homeschooling over the past two years. I am in the middle of re-vamping it, so please forgive the red font, I am just one homeschooling mom working on it bit by bit. I was horrified when I started homeschooling, finding, in this day and age, secular materials being so unbelievably, incredibly hard to find. I’ve spent so many hours just searching! So, I have created a site, in which I check every, single resource to make sure it’s secular. I often contact the creator of a site if I’m on the fence about it. I’m sure sometimes I’ll get blindsided, but over all, I don’t just post a link for the sake of it. Anything that is a secular resource but connected to a non-secular site, is marked with an asterisk to denote that only that specific page is secular. I do realize there is a major “secular” resource out there, but my issue is, there is still a lot of religious content on it. I created a site I would want to visit. Where I could take each link at face value and not be blind-sided by Story of the World or Life of Fred. I understand these are perfectly great resources, but I don’t live in a world where I have to remove religion from math, etc. I live in a world where History is History and Myth is Myth. Where I don’t have to delete entire chapters because they are historically inaccurate. Having said all that, I absolute LOVE religious history. I find it fascinating, I teach my children about ALL religions, big and small and the history of these movements are amazing. Homeschooling has jumped 61% in the past ten years and a huge portion of that are secular or all-inclusive folks (these two words do NOT mean the same thing!). I live in the south, a progressive southern city, but still, I have no shortage of secular groups, co-ops, etc. We are out here and we are ready to be heard. There are non-religious items. They might not be the big names, but they are there and can be found. Even some of the more common ones are non-religious. It might mean not using a “box curriculum” and that should be okay. Many homeschoolers, even religious ones, don’t use “box curriculum”. Not talking just about curriculum. I’m talking to bloggers, podcasters, Periscopers, and all the other types of homeschool resources out there that almost always have religious content in them…I’m asking creators to think about perhaps keeping some of their content religious free so more children can benefit from them. There truly are not that many TRULY secular resources out there that are actually good quality. Not anywhere near the variety that is provided for religious homeschoolers. I think that needs to change. Why not implore a secular curriculum publisher to sell to home schoolers ( That’s how we started back in the day. We asked the Christian school publishers to sell to homeschoolers)? There is a ba-jillion of them out there that sell to public schools! Or, ask your local public school to allow you to order with them when they order new books? Or, let you buy their old ones? Why ask Christian publishers to rewrite their curriculum? That is very expensive! I am not speaking just to the curriculum publishers. I am speaking to all content creators: bloggers, podcasters, Periscopers, and people who create all sorts of homeschool resources. And I am not interested in public school resources. If I wanted those, I’d put my kids in school. Most of those textbook companies produce garbage. Not interested in what they’d produce. I don’t think it has to be expensive. If they were inclined, they could modify curriculum and offer the secular version in ebook format to test the market. Or they could ask for feedback, do a little research, to see if there is an audience out there for secular materials. They just don’t seem to care. Being made invisible is the hardest part of being a secular homeschooler. It might not seem expensive for a religious based curriculum provider to produce a secular one but we are not the best judges of that. Curriculum providers, or any business must make money. More businesses are trying to attract secular homeschoolers but historically, we don’t spend the “big bucks” that religious curriculum once brought in. Not even close. Believe me, providers care, they want to make money. We haven’t provided much money. Public schools have TONS of money so that is where providers concentrate. Personally I never felt “invisible” being a secular homeschooler just because I had to work (and pay) to find materials I used. have never expected that, personally. I’m so grateful people share what they have created, most often for free that it never occurred to me to ask them to change it for me. Secular isn’t anti-Christian any more than off is a tv station. Secular means no religious bias, any religion, it’s not anti-Christian. Secular does not equal anti-Christian…it means NON-religious. There’s a HUGE difference. And I don’t think there’s anything selfish in asking content creators, NOT just the major curriculum manufacturers, but the hundreds of other homeschool content creators like bloggers, podcasters, and Periscopers, and people who create other resources for homeschoolers, to remember that there are homeschoolers of all beliefs out there. NOT JUST CHRISTIANS. All I’m asking is to remember us. And I am creating secular content. But we need a lot more people doing it. The more, the better. I have never come across any curriculum that is anti-Christian. Can you name some so I can take a look? From what I’ve seen, most Christian curriculum and materials cater to a very narrow segment of the Christian population. Pro-life, young earth, creationists, climate change deniers, homosexuality as a sin, etc. There is a large swath of Christians who do not believe as these Christian publishers do. But then again, if a publisher’s intention is to push religion rather than help children, even secular Christian ones, be educated at home, they have little motivation to make accommodations. I would agree. Work up a project, field trip or lesson plans and share!! I personally never could count on that. I’ve heard, “I’m too busy”, “I’d like to drop the kids off”, etc. We were lucky if someone actually planned one outing. I do. I am. All the time. We need more. Lots more. I have very little faith (see what I did there?) that most religious publishers would ever feel compelled to cater to us seculars, however, there are some that do and I’m glad to give them my business! I also wanted to note that I have come across secular curriculum that offered the parent a way to modify it to meet their religious beliefs (like, changing lessons on evolution, etc.). It can be done. Easily and simply. That is, if the publisher’s interest is really homeschooling. (I know I keep talking about curriculum and not homeschool podcasts, etc., as the blog addresses, but curriculum is all I personally have experience with). I purchase a wide range of curriculum, and use a lot of secular source material (Smithsonian, National Geographic, MOOC’s, etc.). You know what I would really like to see when I walk into a homeschool store or sale [predominately stocked with fundamentalist Christian and conservative Christian material]? I would also like to see history books that do not begin or end sentences with “Because they turned away from God …” and/or refer to said countries/peoples as “Godless”. Really? We’ve polled the entire nation of ______ and they are ALL against whatever sect of Christianity this publisher adheres to? While we’re at it, can I have a World Religions curriculum that is objective, concise, includes workbooks, tests/quizzes, maybe even a DVD? This is important knowledge to equip our students with before they go off into the wild blue yonder. People of other faiths or no particular faith or very-loudly-against-any-sort-of-faith will come into contact with my kids. I want them to know exactly what they’re talking about, but more importantly, how to have these discussions with respect and sensitivity. Well, it really doesn’t matter whether we talk about curriculum or not. All of these resources need to make money, otherwise why provide material that is researched or time consuming to produce? If secular homeschoolers want secular material, they need to pay. They need to “compete” so to speak with other resource providers. It used to be box curriculum by large companies. Things have indeed changed but the economics have not. If I want, say, science based experiments view-able by the public, the I will need to pay. If I expect sponsors to pay for said experiments and scientist, then they expect me to buy from them at some point. i.e. ads and they want to see data showing just how much traffic/interest and money is being made. If there is truly a need that pays, someone will produce it. Guaranteed. So, secular homeschoolers need to step up and financially support those producers which give them what they want. Oh, FYI, Amazon isn’t always the best means of support. I can relate to this post . We live in the rural south….and we are Jews….and we homeschool . Ever try to find a Jewish homeschool curriculum? Well, it doesn’t exist. Over time i have sorted thru the homeschool forest and found resources that work for us. No box set, but if I’m honest a box set wouldn’t be my first choice anyway. We love: All About Reading, All About Spelling, Saxon Math, Pandia press for history which includes Story of the World, elemental science, G.U.M. Drops grammar, language lessons for the well trained mind. I can’t say God is never mentioned in these resources, but it is kept to a minimum. Hope these resources help. I, too, have moved to Florida, where unless you are in a big city, welcome to the Deep South!!! Even the Florida state homeschooler association is Christian only. I’m more of a practicing Buddhist and my husband is from India. I went to a homeschool convention (to look at curriculum in the expo area, and they had some good topics). It was so, over-the-top uber Christian with praying and ALL examples in class being Biblical. I love sites like this, and Charlotte Mason, because it IS easy to make it secular. I’m changing copywork to some of Thich Nhat Hanh’s writings, incorporating some of those works into reading aloud, and adding meditation/mindfulness into the morning. I appreciate CM’s focus on nature–that’s very pagan, buddhist, etc. friendly! Thanks for this blog. I appreciate feeling a little less alone WAY down here! !